Generally, electric shavers are more expensive than the manual shavers. However, in this digital world, no one is comfortable with manual products. While it comes to shaver and trimmers, it’s pretty obvious. The manual shavers are time-consuming and hard to use as well as not user-friendly. When we think about nose and ear trimming manually, it looks abstract. That is why all people intend to use electric shaver and trimmers but very careful about saving extra money. Keeping this idea in our mind we researched and found some really good and money saving electric shaver and trimmers on our current list. Check below for the best electric shaver under 50 bucks. Panasonic is a Japanese but worldwide company for electronic products. They are very famous for their electric shavers and trimmers. They have achieved a strong position on the electric shaver and trimmer market. Panasonic has some great electric shaver series (Arc 3 to Arc 5) and there are a lot of models in these series. The Panasonic ES-RT47 is their special edition from the Panasonic Arc 3 family. And this is the most popular and seems to be the main model in the Arc 3 series. The most appealing mater in this shaver is, this is very affordable and would be the best electric shaver under 50 dollars. The built quality of Panasonic ES-RT47 is good enough and does not make noise while performing. This is not only a shaver but also a trimmer. So, you can trim your beard in different length with this device. 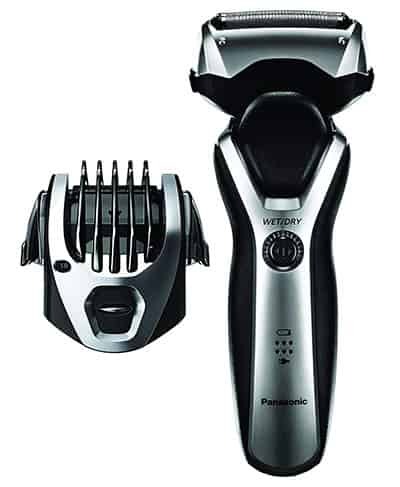 The shaver has 10,000 RPM powerful Panasonic motor to perform fast and give ultimate result in every operation. Although the motor is very powerful, it does not make much noise in the running time. If you use this shaver carefully, the motor will perform very well year after year of use. As you know it is an Arc 3 shaver, it has 3 hypo-allergenic foils for a smooth and comfortable shave. The Panasonic ES-RT47 electric shaver has super-sharp stainless steel blades. The 3 intelligent blades are ultra-thin and 30° precision-honed for catching more and more hairs in every stroke and provide a super close shave. As the foils are made with hypo-allergenic technology, they can adapt the skin contact with super smoothness and provide very mild operation. The shaving head is engineered with the pivoting system which can follow every contour of the face and reach any hard to touch area to cover all the hairs for a very smooth and close shave. Panasonic ES-RT47 has a great combination of soft foils and contour following head for super comfortable shave even in the sensitive skin. The electric shaver Panasonic ES-RT47-S is fully waterproof. For that, you can easily clean the shaver and blades with running tap water and make it germ-free for the next use. This shaver comes with the smart wet/dry feature which offers you to have dry shave anytime and also have a refreshing wet shave with your favorite shaving cream, gel, foam or water. Being 100% waterproof, you can have shower shave under the shower while bathing. Panasonic Arc 3 ES-RT47 electric shaver comes with very powerful Lithium-ion rechargeable battery which provides 45 minutes of cordless shaving with 1 hour of full charge. This must be the great side for such kind of affordable shaver. There is a two-stage LCD indicator on the front of the shaver to show battery remaining time and power progress while charging. The shaver has a built-in pop-up trimmer and there is a trimmer comb in this package. The comb has 5 trimming length settings to trim your beard while you do not need a clean shave but have a perfect beard style. You can trim your mustache, sideburns, eyebrows and also make edges on your beard and hair with the pop-up trimmer. You do not need to use the trimming comb while operating on the mustache, sideburns, eyebrows or making edges. The quality of the trimming comb is satisfactory as the plastic is good enough. Panasonic warrants this shaver for 2 years which is pretty enough for such kind of low budget shaver. Most of the users of this shaver are very happy with it and have very few objections. I did not find any serious objection using this shaver and I’ll personally recommend this shaver while someone is looking for an affordable but quality electric shaver. I think it has more than enough features according to its budget. 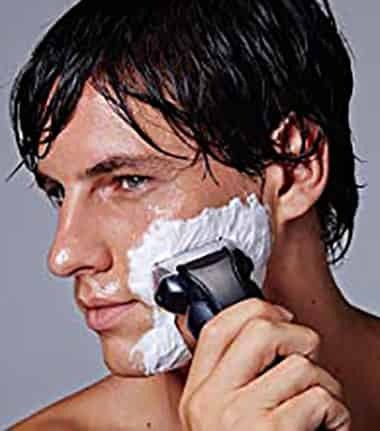 But if you need more features and better quality, you should find premium shavers like Panasonic Arc 5, Braun Series 9 etc. Very Comfortable For Sensitive Skin. Very Short Charging Time (1 Hour). LCD Battery and Power Showing Display. Trimming Comb with 5 Lentgh Settings. Blades become dull quickly, need to replace the blade almost after every 6 months. When it comes to rotary electric shavers, the Philips Norelco brand comes first. In all over the world, Philips Norelco is very renowned for their quality products and they are dominating the electric shaver market in their type. But very few of their electric shavers are available under $50 as they produce only costly shavers. You might be heard about their Philips Norelco Series 9000 electric shaver and you will find the price of that shaver is more than $200 and most of their premium shavers kept their price almost nearby. But there is a good news that we experienced a great Norelco shaver which costs under 50 bucks and the quality says, it could be a costly shaver too in their list. This is in their Series 3000 and the model is Philips Norelco 3100 S3310/81. The Philips Norelco 3100 S3310/81 is one of the top selling rotary shavers on the market and the customer’s feedback of this shaver is extremely positive. We tried and experienced this shaver in all the angles and found a reliable result from this razor. The shaver Norelco 3100 is a wet/dry featured device, so you can shave with your favorite foam, gel, soap etc and also you can use the shaver under the shower for bathe shave. This amazing device is fully water resistant, so you can clean the shaver with running tap water easily. To clean the shaver, you just need to open the shaver head cap with one click and rinse it under water(warm water is better). 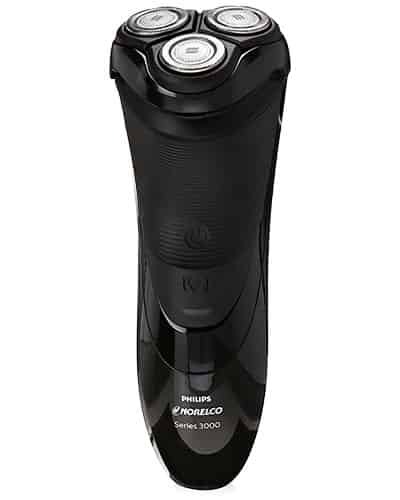 Especially the wet/dry feature and the waterproof feature are not available in the shavers in this range of budget, but Philips Norelco developed the S3310/81 model considering the budget decency. So, this is a super positive aspect for the men who is budget cautious but want to have a great grooming kit. The Philips Norelco 3100 electric rotary shaver is made with black chromium solid plastic so it has a smart look in a fully black body. In the front and back side of the device, there is a rubber grip to make the shaver super protective from the slipping of your wet and slippery hand. Philips Norelco developed The shaver 3100 with comfort cut blade system for an ultimate comfortable haircut. So, the shaver is very suitable for those men who has sensitive skin too. For an easy, smooth and comfortable shave, you just need to make very few strokes without any panic as it features rounded edge comfort cut blade system. The shaver head flexes in four directions in your face and can touch every angle to cut hard to touch beards and neck hairs. This four direction flex head ensures the maximum smoothness of your shave. The shaver is designed for both corded and cordless use. So, you can shave with the shaver while its battery is dead by a direct connection of power plugging in the charging cord. But you should not have a wet shave while the shaver is plugged in. This shaver is powered by a Lithium-ion rechargeable battery which is very convenient and provides consistent power for a long day. There is a bad point in this shaver is, it takes 8 hours to be fully charged, which I think a very long time. And it provides 45 minutes of average performance power which should be much by a full charge. There are very few extras with this shaver as it does not have a cleaning brush and travel pouch but these should not be expected with such kind of budget shaver. The electric shaver Philips Norelco 3100 S3310/81 comes with a pop-up trimmer to trim your sideburns and brows. The pop-up trimmer gives an extra credit to this shaver to be a great grooming device. Everybody knows about the renowned company Philips. And Philips Norelco is a famous electric shaver and trimmer series. 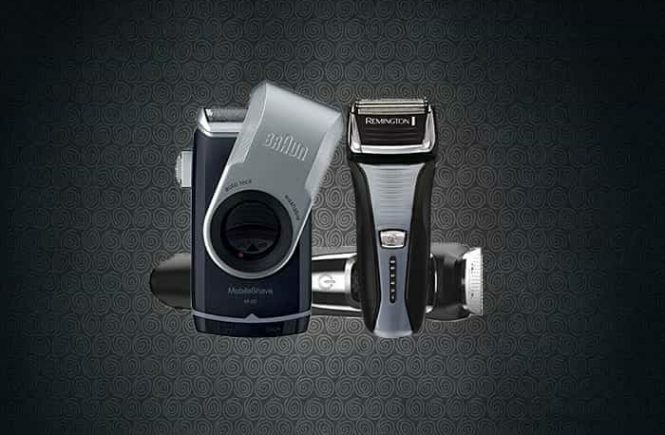 In this popular series, there are some money saving shaver and trimmers. And the Philips Norelco Multigroom 3000 all in one shaver and trimmer is one of the best low cost and best performance electric shaver under $50. This little monster hair removal device provides maximum versatility in maintaining facial hair for you. You can keep your hair in any measurement like long, short or totally clean with this smart device. 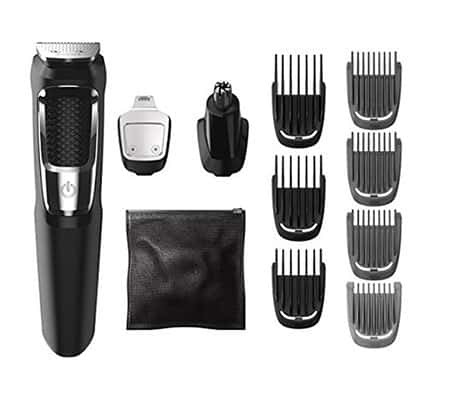 It has skin friendly blades with a various attachment of 13 different tools including a full-size steel trimmer, a steel precision trimmer, a nose, and ear hair trimmer, 3 hair trimming guards, 3 beard trimming guards, a stubble guard, an accessory travel storage bag, and a cleaning brush. It has tempered steel self-sharpening blades which ensures long-lasting performance of this shaver. As it has self-sharpening blades, you do not need to worry about blade sharpness and it will perform highly sharped in a long period of time. It has skin friendly and smooth blades which give a perfect and close shave without irritation. The chromium stainless steel blades are too strong and able to give a great performance over a long period of time, so you do not need to panic about spending extra money replacing the blades frequently. The shaver Philips Norelco Multigroom 3000 takes approximately 8 hours to be charged fully and after a full charge, it can give a high performance of nonstop shaving up to 60 minutes. This cordless shaver and trimmer are water resistant, so you can wash it with soap and water to clean it after frequent use. It itself a men’s shaver and also a men’s hair trimmer. 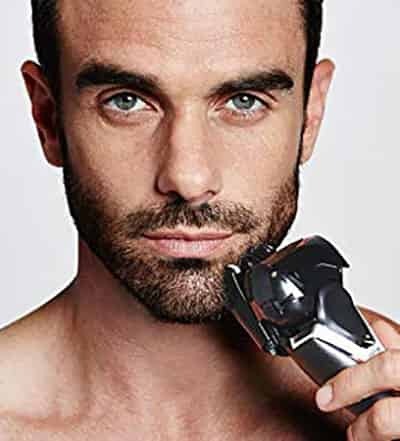 The full-size trimmer is enough for perfect styling of your hair, beard, and mustache by shaving around the edge of sideburn, beard, and mustache. And it is the relatively very low cost which is very affordable and attractive. And the most reliable matter is that this shaver and trimmer is the number #1 best-selling trimmer in the Amazon retailer marketplace. The nose hairs and the ear hairs are very irritable and unwanted hairs. This trimmer especially has a special trimmer for nose and ear hair trimming. This trimming easily unroots the unwanted nose and ear hairs and make you look gorgeous. If you are searching for a professional quality shaver on a low budget, the Remington F5-5800 is a rechargeable electric foil shaver you can undoubtedly think you. It has very useful and lively features which will give you a premium shaving experience with satisfaction. This foil shaver has a beautiful very straightforward design. That is why this is very easy to clean up and washing the device. The surgical steel blades are very smooth to clean. The Remington F5-5800 has a Lithium-Ion rechargeable battery which is able to perform until 60 minutes after a full charge. The very good site of this rechargeable batteries is it takes average 2 hours to be fully charged. Even you can have a quick shave after charging the batteries for 5 minutes with the quick charge function. In the handle of the shaver, there is an indicator of the battery life to calculate the performance duration of the device. This is very special in our best electric shaver under 50 list. 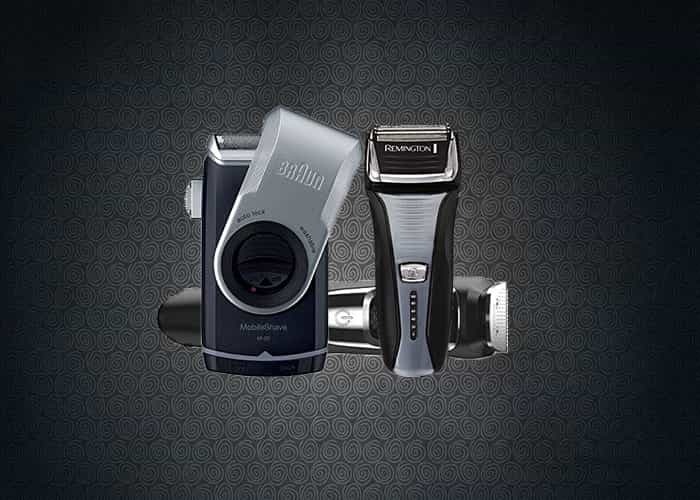 This shaver has Interceptor Shaving Technology which provides very close shave within very few passes. You can use this shaver both with and without connecting the charging cord. While you intend to shave moving around or use this as a portable shaver, you can unplug the shaver and use it until the charge becomes finished. And this is very comfortable for travel shaving. While the charge is running low, you can use the shaver connecting to the power and use it undoubtedly. But we do not recommend this method because this is a little risky for battery life. 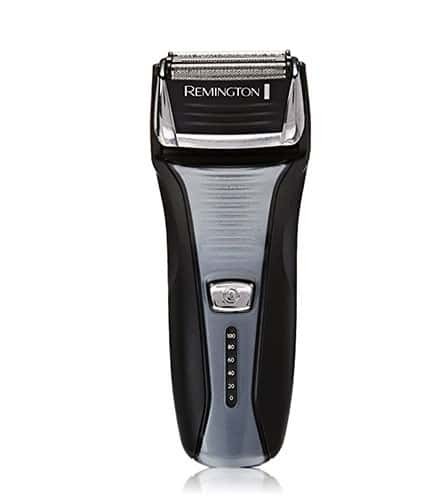 The shaver Remington F5-5800 comes with popup detailed trimmer which is useful to shave complicated hairs like behind the neck, sideburns, and the mustache. This shaver may be used with power of 240 volts and 100 volts. This implies you’ll use this shaver anyplace around the world. it’s a shaver that may be utilized by travelers aiming to completely different countries with different power voltages. When it comes to beard trimmer, you must come again and again to the giant presence that is Philips Norelco. They provide basically the great mid-range trimmer and shavers which are very reasonable to touch. In our best electric shaver under 50 review list, we found they achieved the greatest position. The Philips Norelco 5100 Beard & Head trimmer Series is one of them. This trimmer got the top customer rating out of all the Norelco models. In the head of this trimmer, there are two sides of shaving and trimming. One side is perfect for trimming the hair and another side is great for detailing and grooming the hard to touch hairs. That is why you do not need to change the combs most of the times. The combs are slightly rounded to stay the ends from dig into your face creating a lighter trim. The Philips Norelco 5100 Beard & Head trimmer is very easy to clean. You just need to rinse the head under warm water and wash it. Remember, this trimmer is not waterproof so do not try to use in shower shaving. It has self-sharpening stainless steel blades are designed to effectively cut each hair perfectly, preventing skin irritation. They are double sharpened to cut more hairs in every pass for faster trimming. So you do not need to replace them regularly and as it has self-sharpening blades, it always stays sharp. This is very suitable for travel shaving. The impressive matter is that it comes in 120 to 240 volts power. So you can use it anywhere in the world in any voltage area. There are many trimmers even the number #1 of the rank under $50 electric shaver and trimmer in this review the Philips Norelco Multigroom 3000 takes 8 hours to charge fully. But the Philips Norelco 5100 takes only one hour to get fully charged. And another interesting matter is that it can perform cordless with its Lithium-Ion battery about 70 minutes after fully charged. This shaver has a LED display which shows you the choices which you need. And it locks you with adjustable zoom wheel when you choose your desired one of 17 built-in precision lengths settings. Philips Norelco Beard Trimmer 5100 is that the product good for all lengths and kinds of beards and mustaches. Very few people who have electric shaver experience is unfamiliar with Braun. The giant company Braun especially produces high-quality and costly electric shavers. If you are interested to see the Braun best shavers visit our this post best electric shavers. However, while thinking about the best under $50 electric shaver, The Braun M90 mobile shaver is one of them. This little monster is made especially as a travel shaver. The attractive matter in this Braun product is that this is very beautifully designed and user-friendly electric shaver on budget. The Braun M90 mobile shaver is entirely made from plastic, with no rubber inserts. The color theme options a navy blue for the body of the razor and light-weight gray for the protecting cap and therefore the plastic frame of the foil. The mating end of the navy blue components provides adequate grip. Most significantly, it looks much more costly than it truly is. The Braun M90 Mobile Shaver contains a distinctive shaving head. There’s a foil pattern, that catches hair growing in uncountable directions and cuts comfortably and closely. You do not need to panic about charging the shaver and carry the charger. The M90 is steam-powered by 2 regular AA batteries and that they may be simply replaced with new ones. Depending on however you utilize the razor, a handful of quality alkalic AA batteries ought to offer one hour of shaving time. And that’s really quite sensible. you’ll be able to additionally use reversible batteries to scale back your running prices to a minimum. Being a basic and easy shaver, the M90 is extraordinarily simple to wash. Moreover, the foil and cutter are often ones by one removed in contrast to on different Braun shavers that use cassettes. This makes the cleanup method extraordinarily undemanding and straightforward. You just need to rinse the shaver under water and easily wash and clean the shaver. It is a Wet and Dry featured electric shaver which is very rare in low-cost electric shavers. You can use it both in wet shave and dry shave. What’s nice is that rather than a separate click on Trimmer, the Braun Mobile Shaver’s Trimmers already hooked up and simply has to be softened on. It’s nice for trimming sideburns and mustaches. However, what this suggests is that if you don’t use the Trimmer, it’s associate degree add-on that you just cannot take away. That is a good point that you do not need to separately carry the trimmer and no chance to forget anywhere. When you have a sensitive skin, this shaver is a blessing to you. This single blade sensitive skin featured mobile shaver gives a close shave without irritation for any type of skin. The Remington PG6025 All-in-1 Lithium-Ion battery-powered Grooming Kit is intended for all those folks that like a superb product with exemplary services. It arrives with dimensions of 3 x9.2 x 4.5 inches and weighs one pound. Men who are on a strict budget could balk at paying over $50 for a men’s shaver, notably if they have a special electrical groomer to trim their beards or alternative facial hair. Remington features a resolution to the current drawback. This grooming kit offers lots within the means of cutting quality. Having self-sharpening blades implies that they’re perpetually unbroken sharp and can offer you an in-depth cut. With the three attachment heads and combs you’ll not solely select a range of lengths, however additionally trim nose and ear hairs moreover because of the remainder of your body. The Remington PG6025 grooming kit offers a real all-in-one grooming keeping beards and mustaches neat and tidy. Instead, it helps you to trim your hair, chest, and back. The nose and ear attachments facilitate to stay the square measures that are exhausting to succeed in neat and tidy. The design of this grooming kit is very attractive with the smart angle. It has an LED battery direction display to show the battery life. Speaking of the power battery, the PG6025 is promoted by Remington as being the foremost powerful in their line-up. The shaver itself comes with a chargeable Lithium element battery, that is meant to effectively direct all of its torsion and power to the motor of the blade, creating it in no time and economical, similarly as able to run sixty-five minutes incessantly before it wants recharging – and also the quality of shave doesn’t alter reckoning on charge levels. Almost all of the people that have tried it realize it straightforward to use. They state that the attachments and combs continue and are available off simply, which the trimmer doesn’t have any options that create mistreatment it difficult. One of the good things regarding the PG 6025 is that it comes with enough attachments to try to everything you would like this trimmer to try to, however not such a lot of attachments that you simply could find yourself losing a number of those attachments. 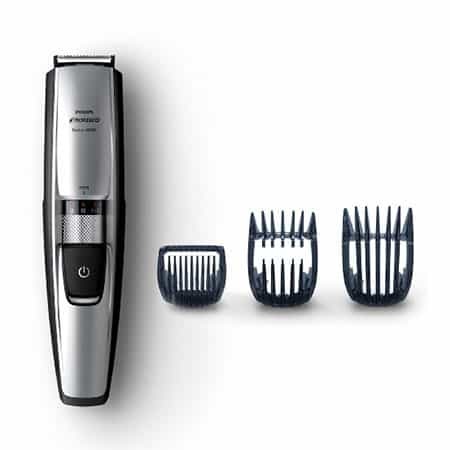 Which are including a Full-size Trimmer; Foil Shaver; Nose, Ear, and Detail Trimmer; Hair Clipper Comb with 8 Length Settings; 3 Beard and Stubble Combs. The battery life may reduce after replacing the original battery. Wrong information, The Philips Norelco 3100 is not under $50 electric shaver. The price is more than $60 I found. Please see there are lots of buying options for the Philips Norelco 3100 electric shaver on the Amazon you can see when clicking on the button “See All Buying Options”. All the providers of the options do not take the same price. I found almost half of the providers offer this shaver under $50 and the others take $50-$70. So, why are you buying the product from the suppliers who demand more than $50? Hi, I would like to have a travel shaver as my travel companion. I want to know, is there any rechargeable travel shaver which I can charge from anywhere of the world? I think, buying the AA batteries are annoying and costs lots of extra money by what I can purchase an expensive shaver after one year. 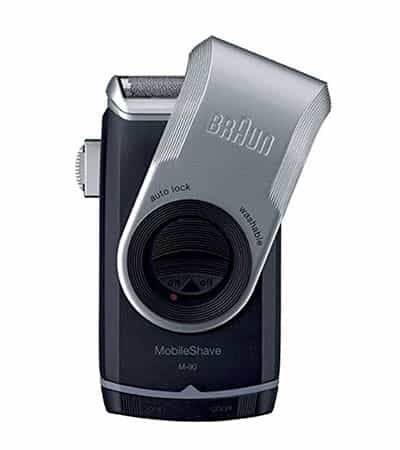 So, if there any rechargeable mobile shaver like the Braun M90, please let me know. Travel shavers are specially designed for travel compatibility as anybody can bear it comfortably. The travel shavers are very lightweight and very little in size, even a man can carry in his pocket. Generally, people do not want to carry an extra device like the charger or cleaning unit with his journey. Another fact is, you may not find the proper plug for your charger everywhere and the voltage of electricity is not the same everywhere. So, your charger may not adapt to the electricity of the other country or state you travel. Most of the time, people forget to bring the charger with them and after the rechargeable battery goes dead, the shaver becomes useless. To avoid such kind of disadvantage, the razor companies designed the battery operated shavers as you know the AA batteries are available everywhere in the world. So, you can easily bear your shaver in a little pocket and use it anywhere buying AA batteries. 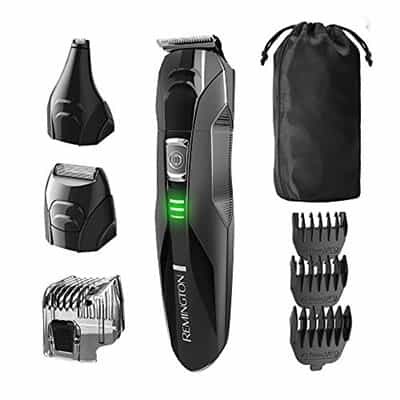 But if you are comfortable with the chargers and strongly firmed to buy a rechargeable shaver, you can buy a shaver which has a little body and very lightweight like the Wahl 5 Star rechargeable shaver which looks like almost a travel shaver. nice items, its best one, and I hope to get one of it.